Prepared by Adley Cormier for the Southwest Louisiana Genealogical Society and delivered at their meeting November 17, 2007. The history of this area is intertwined with the history of our neighbors, of the political entities of which we are part, and of the people and movements that have shaped America in general. This timeline project attempts to provide a context for Southwest Louisiana history, a unique history in a unique state. Southwest Louisiana is geologically part of the Gulf Coast. Where we are standing is the youngest of four Pleistocene terraces, namely the Prairie Terrace. In other words, we are standing on some of the youngest land on the North American continent. The Prairie Terrace surface is very flat generally, and slopes about a foot per mile towards the coastline from here to the gulf. In Lake Charles, the elevation is about 20 to 30 feet above mean sea level. North and west of the city are higher elevations, capping out at about 150 or so at the northern end of what was once called Imperial Calcasieu. So, on our timeline: Dinosaurs roam the North American Continent generally for 600 million years. They visit Southwest Louisiana only at the very end of their existence on the globe. They watch the shoreline build up and retreat at least four times in geologic time, leaving stranded beaches in the terrace. These stranded beaches are known as Cheniers after the French word for Oak Trees which are often found on these elevated strips of land. The Grand Chenier roughly parallels the coastline when you drive Louisiana Highway 82 from Pecan Island to Cameron, you are on its ridgeline. Let's move ahead: 15 thousand BC: prehistoric man migrates over the Bering Land Bridge. By the time they get to Southwest Louisiana, distinctive nations and tribes have been developed. By the time Europeans visit Louisiana, there are at least 6 distinctive nations represented. Southwest Louisiana now shows little evidence of these original inhabitants-- the Attakapas who called this part of Louisiana home. The Attakapas Indians roam all over Southwest Louisiana hunting buffalo and other game, gathering nuts, roots, and berries, and harvesting fish and shell fish. (Before we go on, you may ask about the Coushattas currently living in the eastern part of the Imperial Calcasieu area. The Coushatta Nation relates that their history began in the eastern part of the US. This tribe was literally pushed by European settlers and physically moved to the Southwest Louisiana area in the middle of the 19th century. They are not natives, strictly speaking, to Southwest Louisiana). Now our original inhabitants, the Attakapas, are linguistically related to the powerful Aztecs of Mexico. Early explorers relate that these Indians had rituals that included cannibalism. Some few remnants of this culture remain; most striking perhaps the name of the area in which we live Calcasieu, which is the name, supposedly, of one of their chiefs. The name translates to "Crying Eagle" in the native Attakapas language. Fast forward: Our timeline: sixteenth century AD. Cortez lands on the Mexican coast, subdues the Aztecs (and many other native tribes), sets up settlements in Mexico, thus Texas. Hernando deSoto visits Louisiana and claims the central portion of what is now the US for Spain. He bypasses misses southwest Louisiana entirely. Explorer Cabeza de Vaca probably traverses Southwest Louisiana but takes a left at the Sabine and gets back to Spanish Mexico. Our timeline: seventeenth century AD. The Spanish consolidate claims in Mexico and Texas. France makes a tentative first step in Canada, begins explorations in the interior of the continent. LaSalle travels down the Mississippi River but misses the mouth, later tries to find the mouth but bypasses all of Southwest Louisiana and lands somewhere on the Texas coast. At the very end of the century, the Lemoyne brothers, Bienville and Iberville found Louisiana in Mobile, 1699. Our timeline: eighteenth century AD. The French consolidate their settlements in north west and in eastern Louisiana: Natchitoches 1714, New Orleans 1718, Opelousas and St Martinville in 1740's. Spain consolidates control over Texas with strings of missions. The French garrison at Natchitoches is only 14 miles from Los Adaes (not far off US Highway 171), a Spanish misson in west central Louisiana (and once capital of the Spanish province of Tejas. France shifts Louisiana to Spain. America engages in the pesky Revolutionary War on the eastern shore of the continent. When the British settlements in West Florida (and by West Florida, I mean the Florida Parishes of Louisiana) prove meddlesome, Galvez (Spanish governor of Louisiana at the time) fights with the Americans at the Battle of Baton Rouge. This battle also known as the Battle of New Richmond, is one of the few Revolutionary War battles fought outside the original territory of the 13 colonies. In southwest Louisiana which not quite Spanish Texas and not yet either French nor Spanish Louisiana, a few tentative Europeans make their tenuous first efforts at settlement. A formal expedition led by Jose de Evia in 1785 is the first recorded formal exploration of the area, although there is some evidence of settlement a decade earlier. Popular history suggests the Lebleu family originally from western France and the Sallier family, originally from Italy were early settlers. The area was remote from both New Orleans in the east and from San Antonio on the west. There are just no connecting waterways to allow for safe travel. Overland travel was near impossible with the rugged prairie of Southwest Louisiana and its blade edged grasses, intermittent streams, and marshes. The Calcasieu River twisted and turned with sandbars, snakes, mosquitoes and slow going. This isolation, even at this early date, delays settlement of the area and creates a history rather set apart from the rest of Louisiana. Our timeline: 1803 Napoleon regains Louisiana and sells this huge middle third of the continent to the United States. President Jefferson at first only wants New Orleans (eastern Louisiana) and what is called the Isle of Orleans, but settles in addition for a whole huge chunk of real estate defined as all the land west of and drained by the Mississippi River. Southwest Louisiana is really not part of the sale. Our isolation and the fact that this area is not part of the Mississippi River drainage system leaves us as a sort of neutral strip. Not until the Adams-Onis Treaty in 1819 is the western boundary set at the Sabine River. Until then, the area serves as a bit of a catch all in terms of attracting all sorts of early settlers: Tennessee and Kentucky men who served with Jackson at the Battle of New Orleans (1815), filibusters and rowdies from Mississippi and the Carolinas, some newly relocated located Acadians at the end of their forced migrations from Canada, runaway slaves, Spanish and French Creoles, Texians (emigrant Americans who settled in the Spanish colony of Texas. 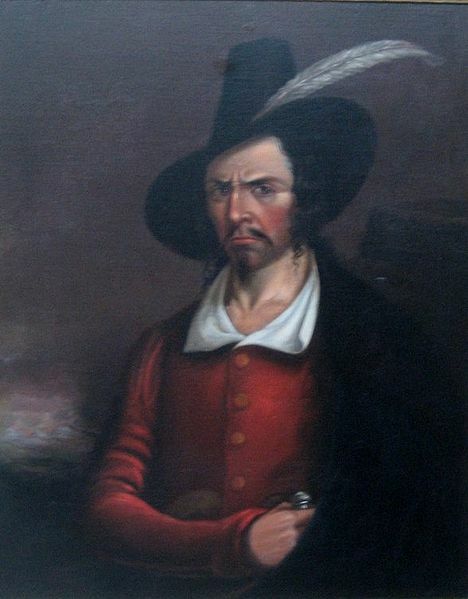 Even privateers, like the romantic figure Jean Lafitte, made occasional forays into the western lands far from the tax-men and bean counters of New Orleans. But what brings these visitors and settlers to this corner of Louisiana are, at first, the broad expanses of grassland frontier upon which cattle could be ranched and the rich cypress and pine easily harvested for a wood-hungry world. These diverse, independent and self-reliant pioneers develop a unique, independent and distinctive spirit, not really the plantation South, nor French/Spanish or Creole Louisiana, nor the Anglo-Scots/Irish lowland or Upland southern cultures of the eastern seaboard. The Cantonment Atkinson a minor US military outpost is erected on Charley's lake to defend this southwestern corner of the young USA. Our timeline: 1840 Louisiana has been a state for a generation. Louisiana is a wealthy state with a huge plantation economy of sugar and cotton. New Orleans is, perhaps, the wealthiest city, per capita, in the United States. All the wealth of the states along the Ohio, Mississippi and other rivers flows through the docks of New Orleans. Galveston serves as the economic powerhouse of a very young Texas still under Mexican control but itching to be independent. Southwest Louisiana is sparsely populated with no real towns, few farms or plantations, and still as isolated as it ever was with only trails to connect it with the rest of the state. For the families settled here, the Ryans, the Perkins, the Cowards, the Pithons, the Lebleus, the Salliers, and the others, life was as hard then as it had been since they located to this corner of the state. To conduct business at the parish seat meant a six to seven day overland trek to Opelousas, as this part of the state was in the parish of St Landry. But in 1840 the old parish was divided and the southwestern corner was established as Imperial Calcasieu parish. Larger than the Delaware or Belgium in land area, the parish was still the smallest in number of settlers. The parish town was set at Marion, a crossroads and ferry crossing about 10 miles northeast of the City of Lake Charles. Back to our timeline: The 1850's America is built with immigrants arriving in waves from northern Europe. In Southwest Louisiana, the Goos family emigrates from Germany along with others from the coastal areas along the North Sea. These German immigrants take advantage of the cypress, pine and hardwoods found along the rivers and strengthen the lumber industry and establish the shipbuilding industry which continues for another 75 years. The Sabine Pass Lighthouse is built in 1856 by the US government. It is perhaps the oldest brick structure still standing in Southwest Louisiana. The 1860's: Pivotally for America, the War Between the States is a catalyst for all sorts of changes. The South is devastated. Louisiana is a focus for capture with Union General Benjamin Butler capturing and occupying the City of New Orleans early in the war. Louisiana is occupied by federal troops for 20 years under reconstruction. Southwest Louisiana escapes major battles, although the premier civil war battle in Texas is fought on and around Sabine Pass, practically on Calcasieu soil. 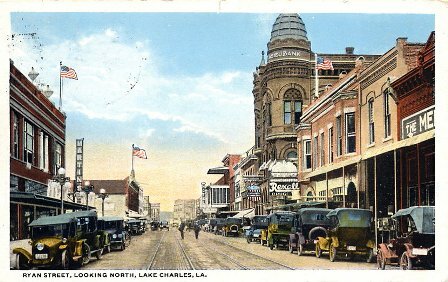 The village of Charleston, founded and named for about a decade, decides to incorporate and rename itself Lake Charles in 1867. Also in 1867, a trained geologist claims that sulfur deposits he discovers in west Calcasieu would prevent any serious coal or petroleum production. Later the Calcasieu Sulphur Mining Company was developed to attempt to mine this element important to the chemical industry. The 1870's and 80's mark a period of great growth for the area. The railroad finally crosses the great prairie connecting the great southwest with the rest of the State and nation. Cameron Parish is carved from the south part of Imperial Calcasieu. Growth in the area includes growth of cattle ranches and citrus farming. Regular ferry service connects the settlements of Johnsons Bayou, Grand Chenier, and Leesburg, now Cameron, with Lake Charles. Transportation links make for better markets for products of the ranch and farm. Land is now made available for development. Midwesterners are drawn to the area and develop towns like Vinton and Iowa. Steel plows, harvesters, and steam engines drain marshes and plow fields. The rice industry commences. An inspired entrepreneur, J B Watkins, determined and declared that Southwest Louisiana is a veritable paradise, unspoiled by the war, with large tracts of land unsettled. He raised and spent a fortune in promoting the area with his North American Land and Timber Company, which bought and sold huge tracts of land. His advertising techniques presaged the marketing and targeted mailings of Madison Avenue. The 1890's: Improvements to utilities, communications and transportation continue to connect Southwest Louisiana with the state and nation. Lake Charles's water service, like its electricity, is provided by Gulf States Utilities. Gulf States divests itself of its water service and a private company provides water service for 99 years. In 1993, the City itself takes over the Water Company. The railroads spread, moving passengers and freight, encouraging commerce. Three railroad stations are developed in Lake Charles. Sulphur, DeQuincy and DeRidder are well served by rail, helping those areas to develop. The Frasch Method for extracting sulfur from underground was tested and perfected in the sulfur mines of west Calcasieu. The successful process broke the Italian monopoly of the sulfur industry and allowed, in some great degree, the establishment of the entire American chemical industry. Commercial grade sulfur was brought up using superheated water, allowed to dry in enormous vats 100 by 400 feet, then blasted and shipped by rail to the Sabine River for shipment. Still, the principal industry of the area is the production of lumber. Trees were felled, branded to the mill, and skidded to the water to float downstream slowly. Around Lake Charles and up and down the Calcasieu River, over 28 mills processed the pine and cypress into rough lumber, siding, beaded board and even into millwork like doors, windows and trim. Several mills were developed and owned by the so-called Michigan Men. These Michigan men built showcase homes on Broad Street the principle east west street in the growing city. 1900: The turn of the century marked a decade of technological advances. The petroleum industry begins in Southwest Louisiana with the first commercial well drilled near Jennings. The automobile makes its first appearance. The City of Lake Charles has three streetcar lines to transport workers to jobs and shoppers to market. Cultural offerings, social clubs, and fraternal organization become institutions. The great storm of 1900 destroys Galveston. Calcasieu Pine and cypress help to rebuild that City continuing the long relationship of the area to that Texas port. The dynasty of the Reid family sheriffs begins. 1906 Teddy Roosevelt is president. The Majestic Hotel opens its doors to augment the Haskell House, Lake House and Howard House Hotels. 1910 The Great Fire of 1910 destroys about 30 blocks of Lake Charles including the Courthouse, the City Hall and the Catholic Church. In a great rebuilding program the parish, the city and the church chose the architectural firm of Favrot and Livadais to design the replacements. Imperial Calcasieu Parish is divided with much discussion and debate into four parishes. Lines were drawn; parish seats selected and the last of Louisiana's 64 parishes are set. Central School is opened to replace an earlier wooden building. Another Favrot and Livaudais production, Central School is also known as Third Ward School. Three other matching but smaller schools were also built at that time. First and Second Ward Schools were long ago torn down, Fourth Ward School (later known as Garber School) was torn down only a couple of weeks ago. 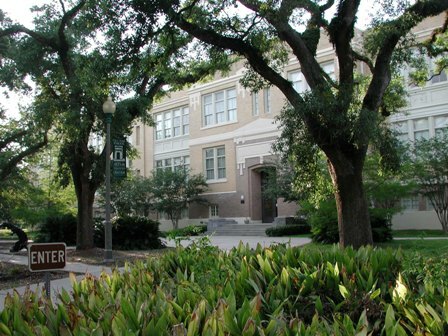 The Ward Schools were part of the City of Lake Charles school system. Until the 1960's, there were two public school systems in Calcasieu parish: City Schools (Central, the ward schools, Lake Charles High) and the Parish Schools. 1914 The combination of a fascination with new-fangled aircraft and the availability of year round flying and flat land yields Gerstner Field, one of the pioneering efforts of Army aviation. This training field just south west of Lake Charles trains hundreds of men who later fought the Red Baron in World War I. Thus begun a tradition of aviation in the area that continues with the establishment of the Lake Charles Air Base, later Chennault which was a Strategic Air Command base (which had the bomb), and with the Chennault Industrial Airpark built on its foundation. At one time lush forests lined all the freshwater streams. The harvesting of lumber, already in a decline, will soon disappear. The growing automobile culture causes the loss of the streetcars. The three Lake Charles lines are abandoned. Rosa Hart and a handful of community leaders started Lake Charles Little Theatre, one of the oldest community theatres in America. They just started their 81st season. 1930 The Depression Huey Long's Louisiana surges toward the future, building a new skyscraper capitol to replace the gothic castle Mark Twain wanted to dynamite. The Mathieson Alkalie Works was founded continuing the chemical industry in Calcasieu parish begun in west Calcasieu by Herman Frasch. Cities Services, Conoco, Grace Davison, PPG, Louisiana Pigment and all the rest can trace their industrial history. The rice industry grows and the worlds largest rice mill is constructed and operates at the foot of Kirkman Street at the River. The Louisiana Maneuvers presage the war. Lake Charles is a transportation point in the complex movements of troop training. Eisenhower visits Lake Charles and develops a close relationship with Emma Michie doyen of Lake Charles society and manager of the Majestic Hotel. Lake Charles Junior College opens on the old parish poor farm in 1939. It is a part of LSU. Soon it is renamed after the first parish school superintendent John McNeese and is perhaps the only university in America named not for its founder, or patron, but for an actual educator. 1940 The petroleum industry forges full ahead. Maplewood, a planned community near Sulphur is built to house the workers. The war in Europe and in the Pacific makes fuel a priority product. The refineries are in full production and the City expands south and east. The talk of the town is the sensational trials of Toni Jo Henry in Courtroom A of the historic Calcasieu Courthouse. The lurid details of the murder and the tarnished glamour of the defendant Toni Jo made for a tabloid drama that distracted from the early war years. Her electrocution on the steps of the Courthouse marked the end of the last woman to be executed for murder in the parish where the murder was committed. 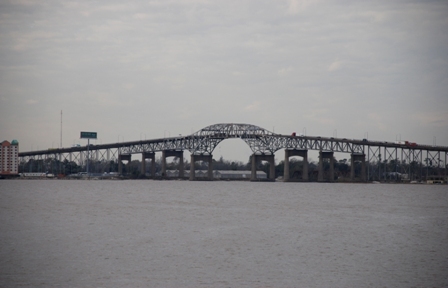 1948 The Calcasieu River Bridge, also known as the I-10 or Pistol Bridge is opened for traffic on Highway 90. Before that time traffic crossed at the foot of Shell Beach Drive on a lift bridge. The remains of that bridge can still be seen. Before the bridge, you had to take a ferry to Westlake. 1950 The decade of Truman and Eisenhower As the American consumer demanded more goods post war and the economy of southwest Louisiana became more interconnected with the mainstream, our future was more clearly connected with the ups and downs of the overall American market. 1957 Hurricane Audrey roars through Southwest Louisiana leaving a wake of destruction. Cameron and Calcasieu rebuild. 1960/1970 Ryan Street was the commercial and business hub of the area with continuous storefronts from Mill Street to Clarence Street. There were department stores, specialty shops, diners, theatres, drugstores, professional offices, hotels and government offices in a concentrated area downtown from Front Street (now Lakeshore Drive) to Hodges Street. In the early 30's Ryan had supplanted Railroad Avenue (once known as Battle Row) as the principal commercial street. In Sulphur, Huntington and Napoleon served the same purposes. Each town had its urban core. As the 50's slid into the 60's and 70's, the growth of the automobile culture began erosion of the urban core. With cheap gas, cheap land, and automobile status merchandising, markets were developed on a suburban scale. This was a national movement. In the City of Lake Charles at least, a very drastic vision was adopted and vigorously set into action. Unfortunately the vision was that historic buildings were expendable and that new was always better. We saw the wholesale demolition of many landmark status buildings. In New York, they tore down Penn Station to build the new Madison Square Garden. In Lake Charles they tore down the Calcasieu State Bank to build nothing. They tore down the Majestic Hotel (which housed every president from Teddy Roosevelt to John F Kennedy) to build nothing. They tore down the Paramount Theatre, a real movie palace, to build nothing. They tore down the Elks Home, the Weber Building, the Kress Building and Woolworth's to build nothing. They tore down the Missouri Central Station; they tore down the Kansas City Southern Station. The Arcade Theatre (where Houdini amazed the locals, and where the St Louis Symphony played to sellout crowds) caught fire and then they tore it down. The Southern Pacific Station was torched, then they tore it down. And while they were tearing down most of our visual history, they ripped up the wharves and warehouses on the lake and filled in 64 acres of lake and built 40 acres of parking lots and a marginally attractive Civic Center. And they blocked the major north south road to construct a pedestrian mall and produced a maze of one way streets to nowhere that virtually killed down town Lake Charles. In the 80's and 90's, once the death knell had sounded twice and was on the verge of the third and final tolling, finally Ryan was reopened, phony facades were ripped off to reveal the city of brick that was built following the Great Fire. As we truly enter the first decade of the 21st century, Southwest Louisiana and Lake Charles is reassessing what is important and necessary to live well. Part of living well is knowing what came before, what roads led us to where we are today. It's a lot like knowing who your ancestors were. Their history is your history. After the paired disasters of Katrina and Rita, we're rebuilding and we are also redefining ourselves. It's an exciting time to be living in Southwest Louisiana. I think that the area has the resources and potential for excellence and for defining a way of life that will be envied. There has been a great demand for change and for positive growth. Projects that have great economic impact and greater symbolic impact are in the planning stages, being built, or are on the verge of being completed. I relish our history and I relish our history of change. I challenge you to help bring the best of change by making informed and careful choices and by entering the public discussion and planning for the changes we know we can shape.